Khachaturian’s piano concerto was composed in 1936, while he was a post-grad student at the Moscow Conservatory, under the tutelage of the great pedagogue, Nikolai Myaskovsky, who encouraged Khachaturian’s use of folk music and ethnic flavors in his compositions. It premiered in 1937. With its driving rhythms, distinct flavors, accessibility and charm, it was an instant success. 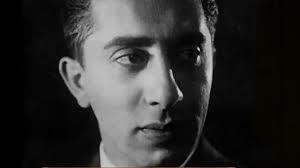 Khachaturian garnered high Soviet honors and his career instantly took off. He would continue in his highly successful, highly public career, to give the Soviet regime what they wanted, and they would continue to reward him for it. Between 1936 and 1946, Khachaturian wrote a set of three concerti for the piano trio of Lev Oborin (piano), David Oistrakh (violin), and Sviatoslav Knushevitsky (cello). What did you think? Even though I’m a strings person and would normally gravitate first to the violin concerto, or its cello counterpart, it’s this Piano Concerto that has stolen my heart. I’m so intrigued by to those delicious, slightly dissonant chords — Khachaturian loved incorporating intervals of the second. 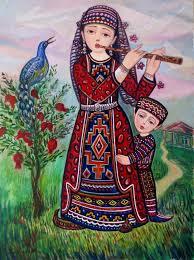 He also embraced the Oriental music idiom, which surely pairs well with Armenian folk music. And that second movement — oh wow, it never fails to cast a spell on me. It creates such a vivid inner state, the way the full moon on a warm summer’s night makes you feel like you’ve stumbled into another realm. Lying in the grass, looking up at the stars, everything tight in you eases and the world of imagination and possibility unfurls before you like a grand, endless, magic carpet. Story has it, it’s based on a Transcaucasus melody. A bass clarinet introduces and ends the movement. A new instrument for me; I’d been so sure it was a double bassoon, so deep and gorgeously brooding, but nope. Here, the bass clarinet is utilizing its full range—an octave below the more common soprano clarinet. It lends the movement its unique sound (the bass clarinet is more common in concert bands than in classical orchestration), along with that flexatone. Most recordings don’t use the flexatone, and instead let the violins carry the melody, which is a shame. Once you’ve heard a recording with the flexatone, without it, the strings seem to muddy what was mystical and wonderfully spooky. And the piano dialogues differently with a solo instrument. But, with or without flexatone, the movement is just stunning. Lush, spacious and so viscerally satisfying. And again, there’s that dissonance in the chords that works so deliciously. 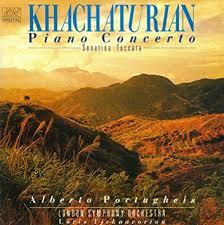 Remember what I said above about Khachaturian’s love of incorporating intervals of the second” ? That’s what you’re hearing. Here is the second movement on its own. Very much worth a listen even though it doesn’t have the flexatone. The soloist is Aram Avetyan, it’s the Armenian Philharmonic Orchestra, conducted by Eduard Topchjan. Khachaturian has got a rollicking good violin concerto too, and a cello concerto that doesn’t strike me as mind-blowing as the piano concerto, but let me know if you disagree. 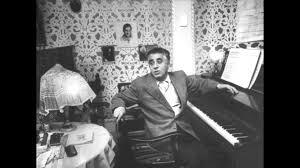 Khachaturian was more prolific than a lot of people realize, probably because, as a Soviet composer, much of his work found a home only in the (former) USSR. He composed quite a few film scores, which I hadn’t realized. In later years, he composed another set of three concertos — actually, concerto rhapsodies, which are a “single-movement, multi-sectioned concept balanced between cadenza and fantasy.” My ballet readers will know and love more than one Khachaturian composition, maybe not even realizing who the composer was for the Bolshoi’s ballet, Spartacus, and its gorgeous, romantic Adagio pas de deux. And the sweeping “Masquerade Suite.” And the Soviet ballet, Gayaneh. From the above ballet, this stunning violin adagio: https://youtu.be/K6ZBSdjzKfk It’s featured in Stanley Kubrik’s 2001: A Space Odyssey and also heavily borrowed from by James Horner for his soundtrack to Aliens. Adagio from Spartacus for music purists https://youtu.be/LZLMKkEGFRo This one is all sound, no ballet, and I think its sound says it all. A more nuanced listening experience than the above. Here is my absolute fave, “Masquerade Suite.” The ballet dancer in me was instantly smitten upon hearing this, decades ago. The love has never abated. In fact, let’s embed so all can enjoy. This entry was posted in Ballet, Classical Music and tagged 20th century composers, Alicia de Larrocha, Aram Avetyan, Aram Khachaturian, Armenian composers, Armenian Philharmonic Orchestra, Ballet Gayaneh, Bolshoi's ballet, David Oistrakh, Eduard Topchjan, flexatone, Khachaturian Cello Concerto, Khachaturian Masquerade Suite, Khachaturian Piano Concerto, Khachaturian Violin Concerto, Masquerade Suite, music from ballet Gayaneh, music from Stanley Kubrik's 2001: A Space Odyssey, piano concertos, Rafael Frückbeck de Burgos, recording of Khachaturian Piano Concerto with a flexatone, Soviet composers, Spartacus, The Sabre Dance, Violin music from 2001: A Space Odyssey, what a flexatone sounds like, what is a flexatone on August 6, 2018 by admin.